Stokesley Food Fest in nearly here, and we hope lots of people from Stokesley and beyond will come to our delightful market town to enjoy it. The main activities are taking place this week and over the weekend. THURSDAY 4TH OCTOBER – Starting withThe Co op coming along to The Globe library sharing the work they do in the community support for our local charities. Also The Globe are opening up their community recipe book again to add those treasured favourite recipes. SATURDAY 6TH OCTOBER – We will be welcoming our award winning Farmer’s market to Stokesley, with a huge amount of delicious local producer stalls to buy from. SATURDAY 6th OCTOBER – the evening festivities kick off with aLIVE music event on The Plain with The Mill and Il Mulino, providing top notch food and 3 LIVE music bands, this is a ticketed event ( if you are super lucky there may be a couple left!) It will be a great night in the marquee we are sure! SUNDAY 7th OCTOBER – the celebrations continue with the FoodFest event on the Sunday. With over 15 stalls trading on The Plain, showcasing some amazing food products you might not have seen before as well as food demos and plenty of LIVE Music. New art club Little Brushes will also be in the Town Hall for some FREE children’s activities, with The Hungry Caterpillar! Full details of Sunday’s line up for demo’s is below. We hope you all manage to get along to one of the events and allow us to grow the event for next year. 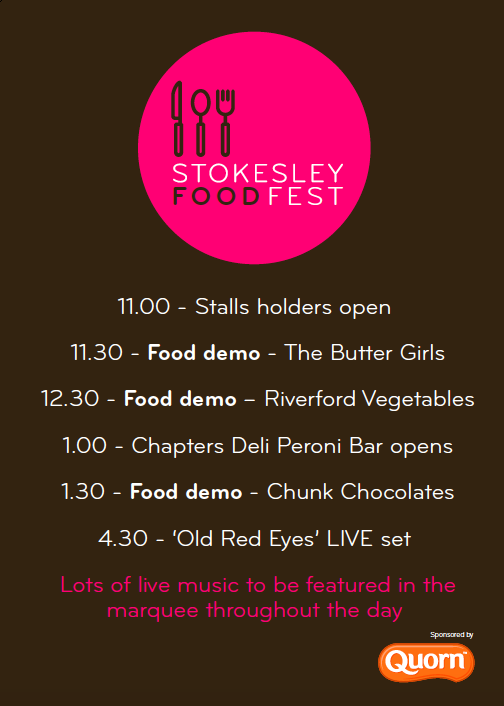 The FoodFest would also like to thank Quorn Food and Stokesley Town Council for their continued support. Other businesses around Stokesley are also supporting the FoodFest with their own in house promotions, have a look around, it’s the weekend to eat well in Stokesley!